Set in the British countryside in the miserable austerity of the post-war 40s, THE LITTLE STRANGER sees the last remnants of the aristocratic Ayres family call on the new local doctor, Faraday, to attend them at Hundreds Hall. Faraday’s mother was once a housemaid at the hall, and he recalls with warmth a glorious afternoon in his childhood when he visited the house in its heyday. Since then, the house has fallen into disrepair. Too impoverished to maintain the decaying Hall or to employ more than one maid, the family must sell off the land piece by piece to survive. Horrified by the piteous state of the place which he idolises, Faraday slowly becomes more entangled the family’s affairs – and begins to realise that there may be a ghostly presence at work there. A period drama with supernatural elements, THE LITTLE STRANGER features a wealth of talented players. Directed by Lenny Abrahamson (nominated for Best Director at the Academy Awards for ROOM (2015)) from the novel by Sarah Waters, it stars Domhnall Gleeson (GOODBYE CHRISTOPHER ROBIN, EX MACHINA) as Faraday, Ruth Wilson (recipient of a Golden Globe for her portrayal of the heroine in the BBC miniseries JANE EYRE) and Charlotte Rampling (45 YEARS), among others. With such solid component parts, one could be forgiven for anticipating the best. Horror fans might justifiably expect an exquisite doll’s house of a film along the lines of Park Chan-wook’s THE HANDMAIDEN, the adaptation of Waters’ earlier novel FINGERSMITH – or a luscious gothic confection like CRIMSON PEAK. Unfortunately, the film fails to deliver on its genetic potential. The worst thing about THE LITTLE STRANGER is that it is not merely bad, but disappointing. The setup is ripe with gothic promise. Particularly powerful is the age-old idea at the heart of any good ghost story: that actions from long ago can echo down the years, drawing the past and the present together with violent consequences. The first act of the film is strong: Faraday ingratiates himself into the Ayres family, disbelieving of his luck at being invited into their hallowed circle – only to find himself not merely a pariah (no one believes he is really a guest at their party), but perpetually disappointed by the human failings of his aristocratic hosts. The drawing-room pomposity of the party feels both awkward and sordid, a far cry from the sanitised sentimentality of DOWNTON ABBEY. When traumatised war veteran Roderick Ayres (Will Poulter) confesses to Faraday that he is afraid there is a malevolent force in the house, Faraday is disgusted at his lack of a stiff upper lip, telling him to ‘stop this nonsense.’ The presence of any ghostly element is initially ambiguous – instances of sudden violence are prefigured by on-edge high notes and ominous rumblings, which only hint at the supernatural. A voyeuristic camera observes the characters through the doorways and windows of Hundreds Hall, suggesting they may not be alone. Frustratingly, the good things don’t stop there. The film is handsomely mounted, with a notable (but not overbearing) contrast between the warmth of the sunlit past and the cold grey austerity of the now. This chilly present is inhabited by an excellent and committed cast. The family (Ruth Wilson, Will Poulter and Charlotte Rampling) give solidly miserable performances, prideful yet sympathetic. Poulter is clearly a gifted physical performer and Wilson, particularly, is brilliant as the emotional heart of the film – but it is Gleeson’s Doctor Faraday who dominates, for better or worse. Faraday is a man filled with self-hatred for himself and his class. 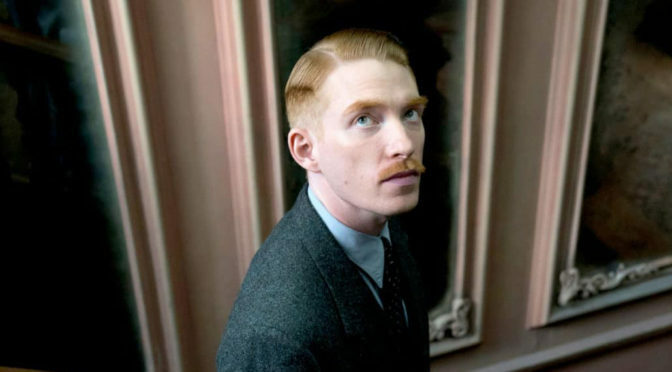 He acts as he imagines the upper classes to act, and as such Gleeson’s performance is a masterclass of repression. The embodiment of the ghostly cold spot, he stalks the film like a gaunt vampire, sucking the life and the joy out of everything he touches. Though it initially seems that Faraday has romantic designs on Caroline (Wilson), it becomes clear that he covets her only as an extension of the Hall itself, the perfect place which embodies everything he cannot have. Early on, her brother Roderick (Poulter) comments that some of Faraday’s equipment ‘looks like something out of Frankenstein.’ Obsessed with the idea of preserving the perfection of Hundreds Hall, Faraday is truly Dr. Frankenstein’s heir – wishing to reanimate something not only dead, but falling to pieces. With all these tasty elements in play in the first act, it’s frustrating that the film then proceeds to fall flat on its face, letting its ripe gothic themes drown in a quagmire of tedium. THE LITTLE STRANGER suffers from several diseases. Firstly, it has major pacing issues. The film runs for less than two hours but feels at least three hours long. This impression is unhelped by the fundamentally unlikeable nature of the main character and the setting, both so chilly and oppressive that spending time with them is, at first, wearing and, later, boring. Again and again we return to Faraday sitting next to windows, bathed in rain-washed gloom and contemplating his own cold existence. Thus we learn repeatedly that Warwickshire is rainy and Faraday is glum. One wishes the director would not force this upon us in real time. Past the midpoint, one hopes for the escalation that usually accompanies a good ghost story – but this never happens. Instead, a melancholy piano narrates the tragedy of Faraday, who will never belong at Hundreds Hall, and Caroline, who wishesdesperately to escape it. The two of them conduct a miserable dance of loneliness and repression, occasionally punctuated by rare, incongruous supernatural happenings – whereupon we return to the agonising humdrum. Since there is no build-up and no sense of threat, these violent ghostly occurrences are not at all spooky; worse, they feel transplanted from a different film altogether. Thematically, the film fails too by falling between two stools. The initial set up hints at a pleasing undercurrent of wrongness rooted in the past (a little like Rampling’s previous outing 45 YEARS). This leads the audience to question the identity of the ghostly ‘Little Stranger’ of the title. However, the remainder of the film suffers from tonal inconsistency. Either the supernatural is completely absent, or present with head-banging obviousness. The film would perhaps have succeeded if it had aimed for full-blown gothic (the character of Faraday, with the suggestion of his unholy symbiosis with the house, would make an excellent bluebeard) – or better, by simply removing superfluous explanation. In this sense it suffers from the same disease as HEREDITARY. Both the explain-all final shot and a scene where characters discuss the theory of ‘the poltergeist’ are vexing to anyone who likes their ghost stories left to the imagination. This aggravating need to explain afflicts the entire film, with unnecessary narration sampled from the book. At best, this narration makes you wonder why you aren’t reading the novel instead. Some of the dialogue, too, is jarringly on-the-nose. At one point Faraday admits to Caroline that although his mother worked herself into an early grave to give him an education, all he feels for his working-class parents is shame. For a man so repressively obsessed with the stiff upper lip, this revelation makes no sense and takes you out of the moment. THE LITTLE STRANGER is an odd, frustrating film. Despite strong beginnings, ripe themes and an excellent cast, the supernatural elements are poorly executed and past the first act the film degenerates into tedium. Succeeding neither as a gothic horror nor as a supernatural-inflected drama, it is likely to disappoint horror fans and bore everyone else. The last shot will aggravate anyone with a taste for subtlety, but by that point you may be too bored to care.